In spite of the ridiculous raincloud I kept over my head for far too long, my race on Sunday morning was really incredible. I woke up early and ate a banana and Greek yogurt (Chobani Champions honey banana - targeted for kids, but I love them anyway - and they're only 100 calories each! ), drank some water, and suited up for the race. I headed downtown, and the El was full of other Shufflers. It was amazingly exciting - plus, it wasn't too hot yet and there was a nice breeze up on the train platform, so it felt wonderful. The starting corrals were in Grant Park downtown, and there was an unbelievable number of people down there. 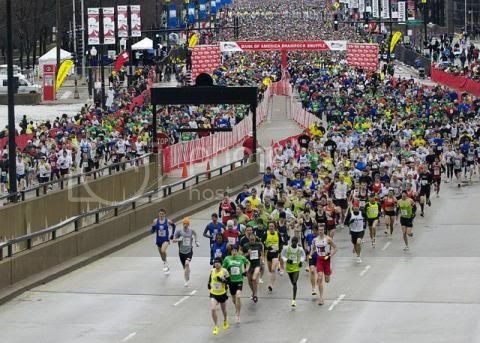 It's the second biggest race in the city after the marathon, and the announcers said it's the biggest 8k in the world! I met up with my friend Lorelei and we checked our bags, hit the port-a-potties, and went to our corral to wait for the start. But soon enough, we were off, and it was fantastic. The sun was shining, it was warm but not horribly hot yet, and downtown Chicago was looking as gorgeous as ever. Some of my favorite parts: running on the bridges over the river, running under the El tracks, running down State Street, and running down Michigan Avenue. It started to get warmer towards the middle of the race, but being downtown and surrounded by skyscrapers, there were tons of shadows and even occasional cool breezes. 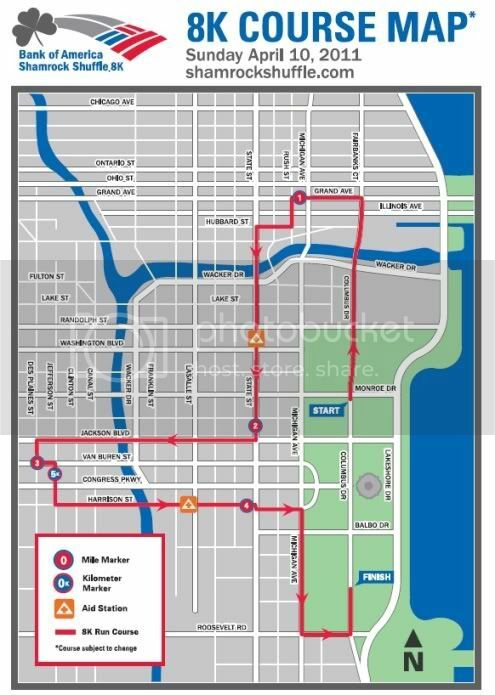 All of my walking 5ks were on the lakeshore paths, which was nice, but being in the Loop and the downtown areas was really fantastic. I'm so endlessly in love with this city. I was really happy that Lorelei kept up with me for most of the race - she had been concerned for a while about not being able to finish, about not being able to run the whole thing, and about not being able to finish together. But up until the last half mile or so, she was right next to me. We were weaving around walkers (forming a row in the middle of the street?! Pretty frustrating.) and when I looked over, she was gone. I powered through the last stretch and then walked around the finishing area looking for her. She was about a minute and a half behind me, and after an excited sweaty high-five, we grabbed water, a banana, and a granola bar. When I registered for the race, I estimated my finish at 65:00 - that was because my time at my first 5k had me at a 12:19 pace, so I figured with more distance, I'd need a little more time. I didn't count on getting faster with training (and losing another 40 pounds between the two races), so as I got closer to the date, I set a personal goal to finish in under an hour. Mission accomplished! I think I could have gone a little faster even, but it was over 70º when I started the race (and over 80º by the time I finished! ), so considering I have never ran outside in that kind of heat before, I'm pleased. 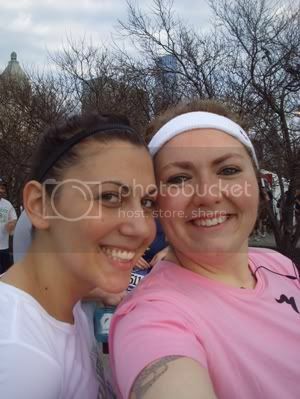 Lorelei and I are both registered for a 10k in June, which is one of my 101-in-1001 goals. We're going to start training outdoors more to get used to the summer weather ... and to just enjoy the scenic lakeshore a little! Running has changed my life - I'm completely in love with it. It's beyond a hobby, it's part of me. I'm a runner. And that's such an amazing thing to be able to say. Oh...I can't WAIT until I can declare that LAST paragraph for myself! I am so at the beginning of my running journey but I'm already loving it. I've found running WITH someone really helps too because you push each other when you want to stop or slow down. I'm glad you have someone to run outside with! I find treadmills so boring!! fabulous, glad the sun has driven the clouds away! i LOVE this it's a great motivator for my 5k next month! What an awesome accomplishment. You shoudl be very proud of yourself. We are proud of you! I am so happy that you had a wonderful day. You deserve it. Great job. Congrats on your awesome time!! That's awesome!!!! AHH!! I'm screaming for you!! WOOHOO!! I am loving this post! You are a runner girl and it shows in your writing! I am glad you both had a successful and fulfilling race! Awesome! Just seeing that map makes me want to go back to Chicago. I've only ever been in the winter. Also, WTG! Even when I was running regularly, the most I ever did was a 5k. You're doing great! Completely inspiring! I can't imagine how proud of yourself you must be!